Safety and security are important, especially if you live or conduct business in a high-crime area or have valuable items to protect with high security locks. You and your property are only as safe as the lock that protects it. Go even farther in securing your place with a lock that assures high security. These locks employ mechanisms that completely block and render nearly useless most typical lock pick attempts. An attacker with anything less than extreme skill would be unable to break into a high security lock in less than half an hour. Even a skilled attacker would need specialized tools and techniques to compromise a heavy duty, high security lock. High security locks provide you with protection and peace of mind knowing you have the utmost level of security in place. These locks add an increased resistance to compromising or break-in attempts. One thing to know about high security locks is that many vendors may market their locks touting that they are high security, but only those that are given an appropriate security are truly considered to be high security locks. The locks with the security rating have been tested to withstand long periods of analysis and have specific design characteristics that improve their ability to resist forced entry or tampering attempts. The most important goal is not to necessarily be tamper proof, but to make it difficult, expensive, and time consuming to try to pick or break these locks. Resistant to Forced Entry – The lock should be comprised of durable, strong material that makes it resistant to any forced entry attempt. Features such as steel rods, ball bearings, or hard materials are often part of the makeup of high security locks. Restrictive Keyways – Complicated keyways tend to frustrate would-be burglars by making it more difficult to insert and maneuver tools within the lock. Key Duplication Restrictions – Most high security locks have keys that are patent protected in order to prevent unauthorized duplication. Some high security lock systems require the that a security card be shown before a locksmith may duplicate the key or require specialty key cutting machines. 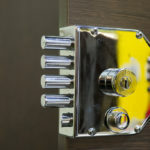 Resistant to Manipulation – High security locks are designed to resist lock picking, decoding, or any manipulation as an attempt to unlock or gain entry through the lock. Most are designed to resist key bumping attempts. Pin tumbler locks often have security pins, for instance. High security locks are typically made with stronger grade steel and higher levels of protection from break-ins. Some are designed to make forcing or jarring the lock loose next to impossible. Others have a complex electronic design. Some of the top high security locks brands include: Mul T Lock, Medeco, ASSA Twin, BiLock, EVVA, Fichet, and Schlage Primus. Contact a local professional locksmith to discuss your security needs and to decide which high security locks are right for your home or business needs to provide the highest level of protection and safety.